Amelia Lesumai has always drawn much attention with her pottery skills. And this year she is doing the same at the weeklong Vodafone Hibiscus Festival at Valelevu Ground in Nasinu. Amelia Lesumai at the 2018 Vodafone Hibiscus Festival at Valelevu Ground, Nasinu, on August 11, 2018. Photo : Simione Haravanua. Amelia Lesumai has always drawn much attention with her pottery skills. And this year she is doing the same at the weeklong Vodafone Hibiscus Festival at Valelevu Ground in Nasinu. You will find her at the National Craft Exhibition with a variety of things she has made from scratch. The 70-year-old from Sawarua, Lokia, in Rewa has been making pottery for more than 40 years. She is married with eight children. Her collection for this year’s exhibition includes pottery, necklace, ear rings, and Christmas decorations. But unlike many who have learnt their craft from their own relatives, she learnt it from her mother-in-law when she got married at 26. Interestingly, she said the skill has enabled her to earn enough money to build her home. “Through this skill I have earned enough to support my children to school and my household expenses,” she said. She said she earns close to $500 a week by selling her products. She has derived her patterns in the clay pots from nature. 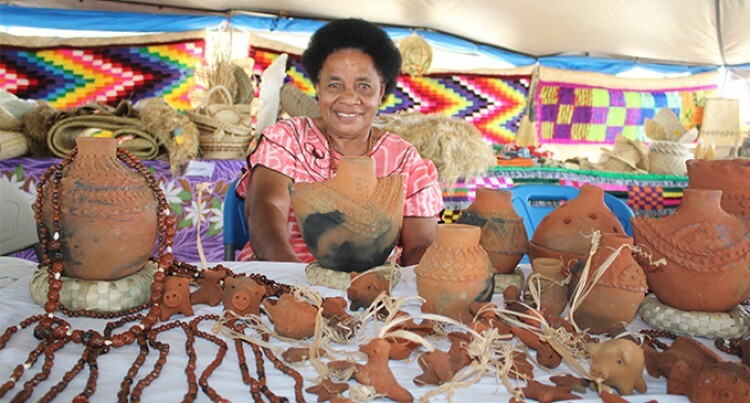 She specialises in gusudua, the iTaukei name for a one-mouth clay pot to store water and gusutolu, which was a three-mouth clay vessel. “We come from the sea, the waves are featured and the people are also present. “I have drawn some people here who are using sticks to catch fish. She said: “The big clay pots take one week to make and I can make three small clay pots in a day. Ms Lesumai encouraged those coming to the weeklong event, especially the young generation to visit the tent. “Children must learn this art not only because it will keep our traditions and cultures alive, but also it can bring in income to run one’s household,” she said.